Beauty. Emotion. Artistry. Drama. Humor. Bravura. Musicality. It is all there for the choreographers and dancers of the Mid-Pointe Project Choreographers Showcase, featuring works by Ursula Verduzco, Benjamin Briones and Brian Norris. 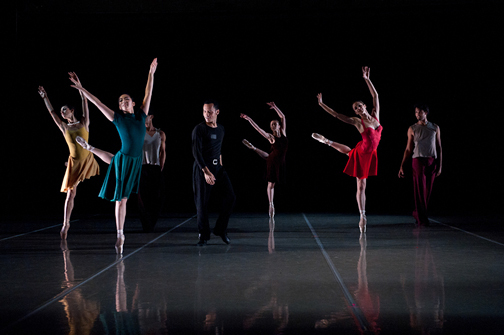 The choreographers are ballet dancers who are approaching the mid-point of their careers. When they had trouble finding venues to present their works, they decided to start their own showcase. I hope that this year’s event is the springboard of what will become an annual festival. A pair of men’s boots are standing at the side of the floor at the opening of Ursula Verduzco’s Nostalgia, a sweet sensual piece with a Latin flavor, swaying hips, swirling costumes and a youthful, happy mood. It was danced beautifully by Laura DiOrio with Shannon Mayor and Mary Susan Sinclair. Throughout the piece, DiOrio approaches the boots, casts an adoring glance at them, then places her hands over her heart as her upper body contracts, as if the tug on her heart is propelling her entire body. I was wondering if the boots belonged to a lover or a crush, or if they represented a fashion from a beloved bygone era. The piece ends with her taking up the boots by the laces and slinging them over her shoulder as she leaves the stage. There’s something triumphant about the way that she carries herself as she crosses the floor before her exit. It made me feel as if the owner of the boots or the era that the boots represent had become a cherished part of the life story of DiOrio’s character. Benjamin Briones’ Vieja Ciudad de Hierro (Old Iron City) is a collection of vignettes, some with narratives that can be comical or heartbreaking. The piece opens as a beautiful young woman fresh out of the shower, clad in a bathrobe and pearls, her hair wrapped in a towel, vies for the attention of the plumber who’s come to her house to make repairs. She succeeds in distracting him just as her husband returns. A series of episodes unfolds, interspersed with lush gorgeous interludes in which the characters seem to abandon the story line and just dance, mostly as couples. 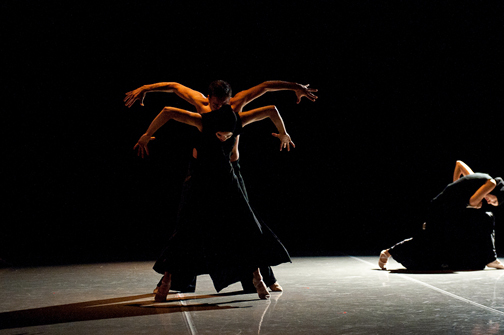 These passages really showcase Briones’ choreographic voice, along with the talent of his dancers. What I loved most was the way that the dance reached so directly to the hearts of those in the audience. There’s an urgency and explosiveness to every movement, even when the dynamics are understated. The narrative sections are also very compelling, each dealing with affairs of the heart, ultimately winding up with two of the characters involved in a knife fight to the death. I also felt that Briones made great use of the space and I loved the energy with which the dance traveled across the floor. Two saloon girls seek the affections of a cowboy in Brian Norris’ Westward Symmetry, a light hearted parody with an all male cast, danced to triumphant Sousa marches. The choreography is not adjusted for the men; the two who play the saloon girls handle all of it on pointe, including a perfectly synchronized series of pirouettes from fifth position. 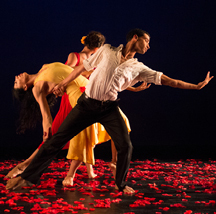 The dancers in this piece charmed the audience completely. Briones’s Zavavy is great fun from beginning to end as two men (Andres Neira and Cristian Serrano-Goden) vie for the attention of a flirtatious young woman (played by Stephanie Wolf). The men take turns swaggering and trying to be slick, but the harder that they work, the less impressed the girl seems to be. Even as she makes it clear to the them that they haven’t scored any points with her, she does manage to find her way back to them, again and again. The movement is big and expansive, it travels and doesn’t stay still, which gives a buoyant happy lilt to the entire piece. Briones is masterful when it comes to making us laugh at the folly of human beings and the silly things that we do. Even as his dancers are being playful and going for the laugh, the movement remains so artistic. 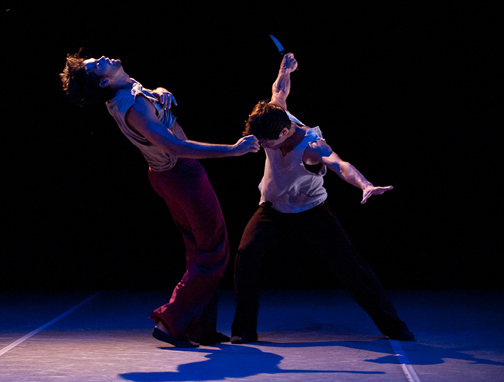 Number 9 is a very sweet piece danced on pointe by Jonathan Mendez to the second movement of Beethoven’s Ninth Symphony. Dressed in street clothes, he seems to be dancing for nothing but the sheer love of ballet. 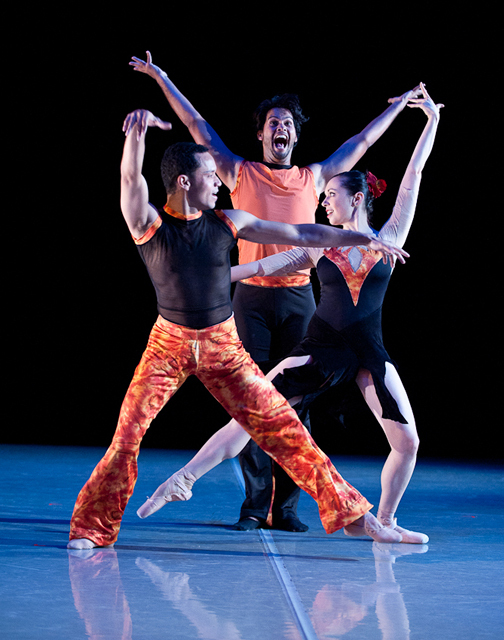 The piece is so lighthearted and humorous and Mendez is just adorable as his ebullience sometimes runs away with him, and he has to stop to correct his own alignment – he pushes his own shoulders down, lengthens his spine, and tucks his rib cage and derriere back into place before taking off again. 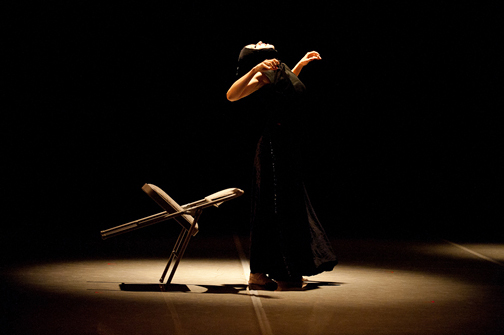 The evening ended with Hidden Souls, choreographed by Ursula Verduzco, which had a Medieval mood, a dark floor and dancers dressed in hooded black robes. The dance opens to the sound of an ancient chant and the dancers enter as if in a processional. The women are completely covered until one manages to push her face out beyond the black scarf that had been covering it. Drama builds as the dance opens up. The women are reaching, yearning, praying, grieving, their bodies tense. Again, there is great use of the space as the dance travels, and the formations in which the dancers move are striking and haunting. There is an undercurrent of mystery to the piece, the presence of an untold story. Gradually, the women shed their robes, and it seemed to me as if the hidden souls were finding their way into the light. I’m really looking forward to seeing what the future of this festival will bring. 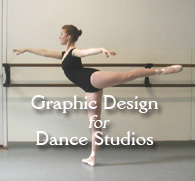 This entry was posted in Dance, Karen and tagged Benjamin Briones, Mid-Pointe Choreographers Showcase, Ursula Verduzco. Bookmark the permalink.